In the 1970s, we still used card catalogues made of paper. It was a point of pride with me that I could navigate that system at a young age (by 10) and locate a book by its digits with decimal points. Perhaps that introduction to the secret society of proficient library users contributed to my love of research-based writing. The first time a librarian showed me how to use microfiche (slides that keep copies of newspapers, academic journals, and books from decades gone by), I felt the thrill of membership to a society of scholars. Fast forward a few decades and it’s no wonder that I gathered my five small children, bundled them in boots and coats against the cold Ohio winters, and invaded our local library every single week. Not content to check out one or two titles per child, we brought two laundry baskets with us to cart our book hauls home. Yes, there was the time when a stack of 20 CDs went missing in our rambling house to the tune of a fine over $100.00 (one hundred dollars I didn’t have). Still, we rejoiced in spring when the CDs reappeared like tulip bulbs, having been hidden under a sectional and blanket. We were refunded our fine and the librarians, forgiving as always, reassured us that they were glad we were back. And that’s just it. Libraries are this incredible gift to our communities—a place where children discover more of the world as it is, aided by research tools, friendly staff, and a wide selection of books there for the borrowing. Libraries offer read aloud storybook times for toddlers, sometimes poetry slams for teens, and book club meet ups for adults. In our increasingly digital world, it’s so nice to know that down the street, there’s a collection of people dedicated to creating a space for research and reading, for community and collaboration. JULIE BOGART is the popular voice of common sense and compassion in the homeschool world. She raised and home educated her five children who are now adults. 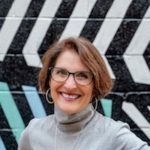 She’s the creator of the innovative writing program called Brave Writer, the homeschool coaching community, The Homeschool Alliance, and the popular fast-growing practice called Poetry Teatime. Julie is the author of highly anticipated manual for homeschooling, THE BRAVE LEARNER.